Help your kids keep their cool this summer by introducing them to the world of water. Water fun is a great way for children to have a great time and release some of their boundless energy while they're at it. And when the summer weather begins to cloud over, there's always the indoor pool! If you're lucky enough to have a garden or even a small patio, a paddling pool can be an unending source of fun for young kids. You can buy one for less than a tenner at your local toy shop, or you can splash out and invest in a larger one that can even accommodate adults. Paddling pools are even more fun if you use a little imagination. Buy pool toys including animal inflatables, break out your children's favourite bathtime friends, or invite some plastic bowls, cups and spoons into the pool for your children to splash around with and enjoy. Adding washing-up liquid can turn a pool into a bubbly delight, and you can even add food colouring to make the water green, blue or red! Bring out the hosepipe for more water fun. Remember, make sure your children are supervised at all times – even a shallow baby pool can be dangerous. If you have no place for a pool, many parks have paddling pools that are open to the public during the summer. Look around locally to see what is on offer. Don't forget the suncream! A sprinkler or hosepipe can bring hours of wet and wacky entertainment to your garden. These water games are sure to make even the hottest child cool down and have fun (adult supervision recommended). Make sure you play them outside only! Hosepipe Tag. Choose the first person to be “It”, then have them chase the others around with water until they are tagged. Make sure there is a designated area for kids who want to stay dry. Water Balloon Relay. Invite children over, then line them up in two rows and give each team a loosely filled water balloon to carry on their head. The first child to drop the balloon is out. Hosepipe Limbo. Start holding the steam of water at chin level, then gradually lower the stream after each child gets a turn. The first child to get wet is out. Wet Musical Statues. Kids get to run around while the music is on – and the water off. When the music stops, they have to freeze – and get sprayed with the hosepipe. Every child who loses that perfect pose when wet is immediately out. Duck, Duck, Splash. This game is played exactly like Duck, Duck, Goose with one exception. Instead of tapping someone on their head, the child who is “It” wrings out a kitchen sponge full of water on their friend's head. Almost every child loves a visit to the local swimming baths. If you haven't been before, look around to see which pool is best for your children's age and swimming ability. Some pools have sloping edges so that even babies can splash around at the sides. Others aren't great for non-swimmers. You may also want to utilise the summer months to enrol your child or children in an intensive swimming course. Often, an entire term's worth of lessons is crammed into a week or two, which for some children is the best way to learn to swim. If you're lucky enough to live near the beach, you're in clover. If not, a day trip to the coast could be the highlight of your child's summer. Take a picnic along and plenty of drinks, along with everything you need for a swim in the sea. Going to the beach needn't be only about water, however. Research the locale beforehand and, if you can, schedule in a visit to the local aquarium or museum. Young children also love spending a pound or three on the boardwalk arcade. While trips to waterparks can be pricey, often discounts are on offer. Look online to see what is available and keep your eyes peeled for special discounts. Kids love waterparks and most adults do as well. The nice thing about them is that usually there are activities to suit a variety of ages, with shallow pools for small babies, so nobody feels left out. 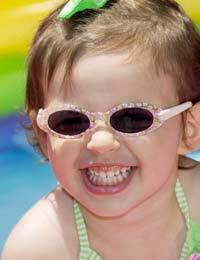 Summer can be an absolutely splashing time if you allow your children to get wet and wild as often as possible. Use a little imagination – and a lot of towels – and you can't go wrong. Cooking Tasty Summer Treats - Outdoors!